With the days to this year’s Long Grove Strawberry Fest (June 22-24, 2018) counting down, we here at Covered Bridge Creamery are putting together our final preparations for the big weekend. And we’re going all out on the Strawberry offerings. It is in fact, Strawberry Fest, right?! Here’s a run-down of what you’ll find when you visit us during fest weekend. First things first, we’ll have 2 of Chocolate Shoppe’s premium strawberry ice cream flavors. The first of which is Strawberry! This award-winning and deliciously fresh ice cream is loaded to the brim with real, whole strawberries. Cheesecake lovers rejoice, we’ll also have Strawberry Cheesecake ice cream on deck! This heavenly ice cream is swirled with a strawberry ripple and contains loads of gooey cheesecake pieces. This is the perfect drink to quench your thirst on a hot summer day. It’s simple and refreshing but packs a strawberry punch right down to the looks. It consists of just 3 all natural ingredients: sparkling water, quartered fresh strawberries, and wildberry hibiscus tea, all poured over ice. It’s crisp, it’s refreshing, it’s downright delicious! Ok, it’s time to get super indulgent here. 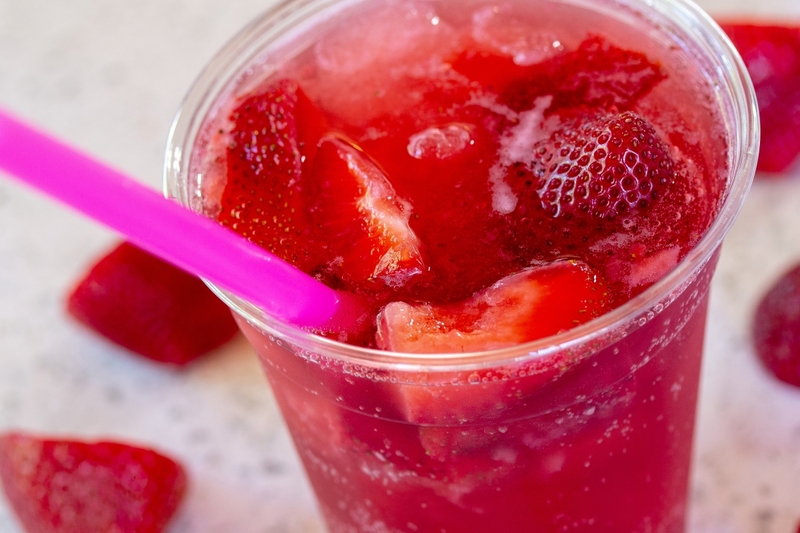 If you’re looking for the ultimate strawberry drink during Strawberry Fest, you’ve found your pick! 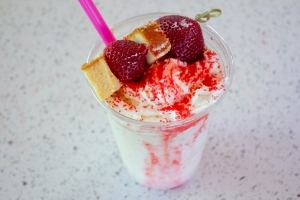 The hot list of ingredients: award-winning strawberry ice cream, shortbread cookies, whole milk, blended and topped off with whipped cream, red sugar crystals, and a strawberry and pound cake kabob. Are you drooling yet? Oh yeah! Last but not least, we’re featuring our coffee-based strawberry drink to fuel your fest experience. It’s a light, refreshing pick-me-up with just the right blend of flavors including a full shot of Metric espresso, whole milk, strawberry flavor shots, and blended with ice. Whipped cream, red sugar crystals, and quartered whole strawberries top off this deliciously creamy latte! And there you have it. We hope you’re just as excited as we are to try one or all of these delightful drinks! Stop by Covered Bridge Creamery this Strawberry Fest and listen to some live music on our outdoor patio at the Grovinia Gazebo. We look forward to making your Strawberry Fest a memorable one! P.S. Don’t forget to visit our sister store, Signature Popcorn, to check out their strawberry-themed offerings as well. You’ll find strawberry popcorn, milk chocolate covered strawberry popcorn, and delectable chocolate strawberry fudge!